The Arcane Divination Vinyl Art Mini Series curated by artist J*RYU was one of wild success. 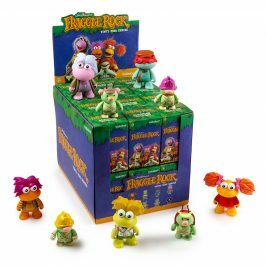 Being one of our most recent Dunny items to sell out and then win the DTA award for best mini series, the details and story of these small and powerful Dunnys continues to haunt us. 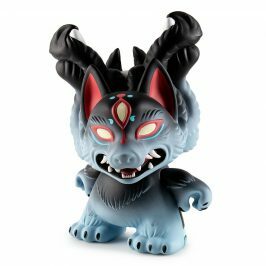 Now, a circle around the sun after the release of the Arcane Divination Mini Series, Kidrobot x God Machine brings you The 8″ Devil Dunny. To say a little bit more about this release is our good friend Chris Holt aka The Toy Viking. Godmachine’s art is not for the timid. His work is as unsettling as it is detailed and can be seen on posters for bands you know and films you love. No matter how dark the subject matter you will find yourself unable to look away, as if each line anchors itself to your soul before the work consumes you. 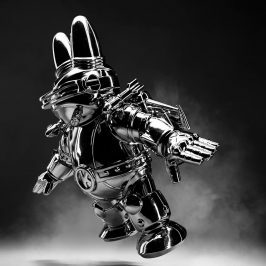 He made his Kidrobot debut last year as part of the popular Arcane Divination Dunny series, having designed three figures unlike any before it. 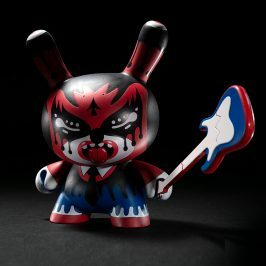 The stand out was The Devil, featuring an illustrated face and gigantic black horns that was one of the most sought out figures by collectors. Now you can live more deliciously than you ever thought possible with a new supersize 8 inch version. Someone once said that the greatest trick the devil ever pulled was convincing the world he didn’t exist. Well, there wont be any question in your mind as to whether this devil is real, because his massive horns are unmistakable. You’re going to need a space ready for him before he arrives on your doorstep and it better include plenty of head room. As humans I am fairly happy we don’t have horns atop our heads as I have a hard enough time with the parts I’ve been given. Throw something extra into the mix and as awesome as they may look, I can see myself banging them into everything. Light posts, doorways, you name it and my horns would leave their imprint. I have a picture in my head of them making me look really menacing when in fact the only danger I would pose would be by accident to the people and objects around me. I’d have to invest in a lot of protective eyewear for my loved ones. 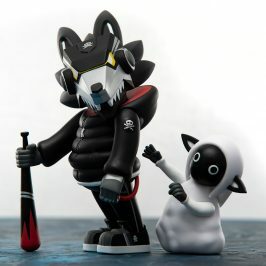 Available in two different colors: the standard black and the very limited Kidrobot.com exclusive white, you’ll be able to replace that pesky do gooder angel on your shoulder with two guys that know how to have a good time. Seriously, they come up with some really fun ideas. 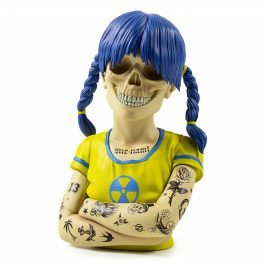 Both versions are available now at www.kidrobot.com.